Our class celebrated the 100th day of school on Tuesday. We made a class book from Deanna Jump's 100th Day Unit. 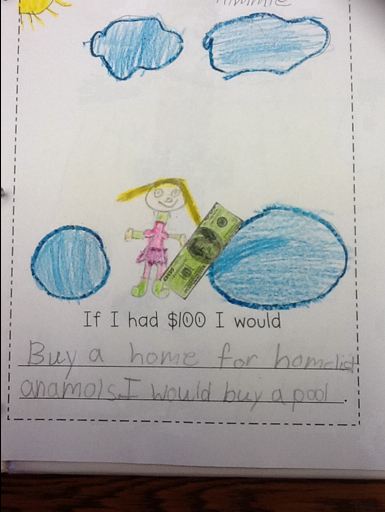 I asked my kiddies to write one thing they would buy for themselves and one thing they would do to help someone else. Gotta love first grade spelling! If I had $100 I would by a home for homeless animals. I would buy a pool. 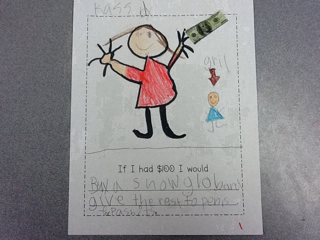 If I had a $100 I would buy a snow globe and give the rest to Pennies for Patients.